The power of Hurricane Michael. 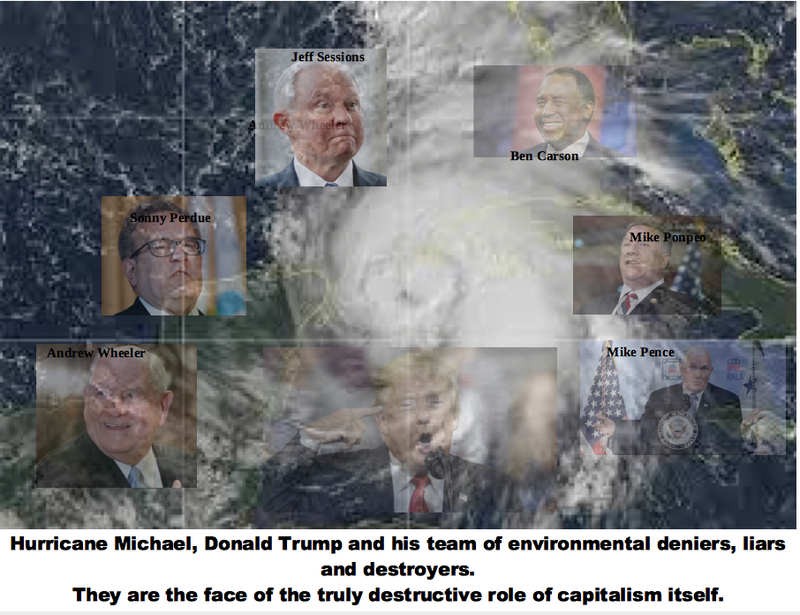 It is vital for the working class movement – and for socialists within that movement – to understand the science behind global warming/climate disruption and its links with disastrous storms like Hurricane Michael. If we don’t make the connections, nobody else will – not the capitalist media, nor the capitalist politicians (Republican or Democrat). As the science would predict, “recent analyses conclude that the strongest hurricanes occurring in some regions including the North Atlantic have increased in intensity over the past two to three decades,” says the National Oceanic and Atmosphere Administration (NOAA). 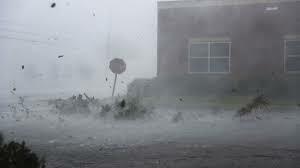 The economic costs of these storms could be lessened by strengthening the building codes. 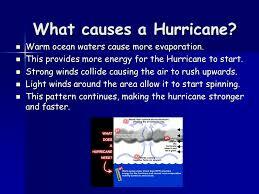 In fact, after the massive damage of Hurricane Andrew in 1992, these codes were strengthened in Florida. Then they were watered down. On the one hand, we have the outright liars – the denialists, who tend to be concentrated in the Republican Party, starting with Donald Trump, who once tweeted: “The concept of global warming was created by and for the Chinese in order to make US manufacturing non-competitive.” Most of his top administrators have taken a similar stance. These include Jeff Sessions (Department of (in)Justice), Ben Carson (HUD), Sonny Perdue (Agriculture), Krstjen Nielsen (Homeland Security), Mike Pompeo (Sec. of State), Mike Pence, Rick Perry (Energy Sec’y.) and Ryan Zinke (Interior). Andrew Wheeler, Trump’s pick to replace climate denier Scott Pruitt as head of the EPA has been silent on the issue, but he’s a long-time lobbyist for the coal industry. Also guilty of this denialism are such US senators as Marco Rubio (R-FL), John Kennedy (R-LA), and Roger Wicker (R-MS). On the other hand, we have the Democrats. During Hillary Clinton’s 2016 presidential election campaign, she never once raised this issue. And now? Which of the top Democrats are pointing to global climate disruption in relation to disasters like Hurricane Michael? Andrew Gillum, Democratic candidate for Florida Governor, has been silent on the issue. Even Bernie Sanders has made not a mention, although he was out in Colorado campaigning for the oil and gas industry’s choice for governor of that state, Jared Polis. Maybe that contradiction was too great for Sanders. 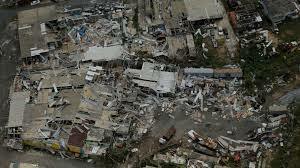 Devastation in Puerto Rico from Hurricane Maria. Although FEMA usually picks up 100% of the tab for such disasters, they’re not doing it in Puerto Rico. The corporate-controlled mass media has been silent on the issue also. Amidst of the blizzard of sensational videos and breathless reporters, who has mentioned the connection? Typical corporate news headline, this one from NBC. The “harsh lessons” don’t include those due to global climate disruption. The lies of the Republicans and the silence of the Democrats and of the corporate media have enabled massive confusion regarding global warming and unfettered corporate control over investment. On the one hand, a Gallup Poll revealed that 62% of Americans believe that global warming is happening now, 68% believe that human activity is the cause, but only 42% believe it will pose a serious threat to them in their lifetime. In other words, the connection between real-life events like Hurricane Michael, and global warming is not being made. County-by-county voting in 2016 elections. Many of those areas hardest hit by Michael will also be the victims of Trump’s environmental policies. it’s exactly this that has created the political climate in areas like Bay County, Florida, maybe the area hardest hit by Michael. 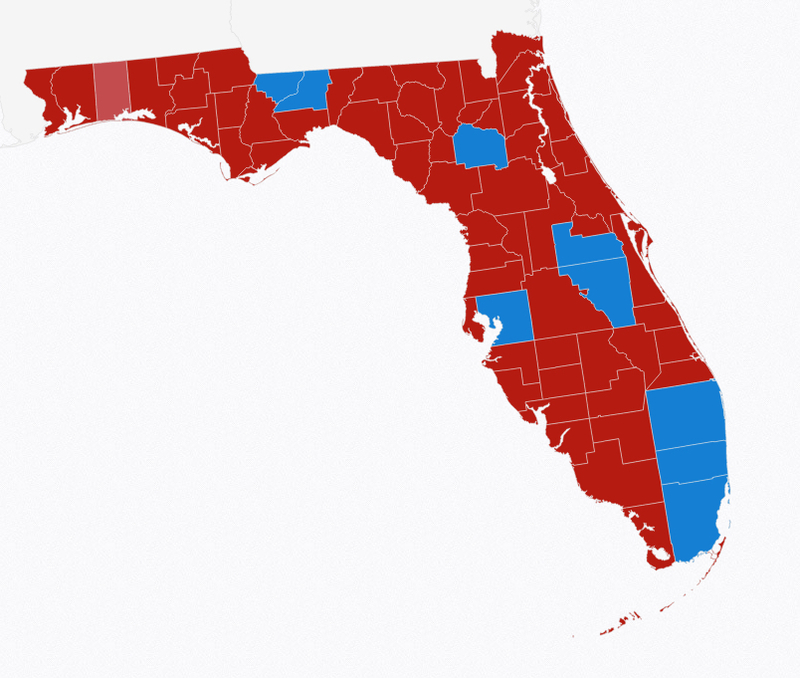 This is also the county that voted 81.5% for Trump (and will probably vote for Republican Ron DeSantis for governor). One thing that has been proven above all others is that the “free” market/investment for profit is an environmental disaster. 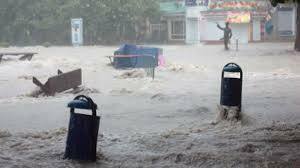 Flash flood in Philippines from Marikina Typhoon. This is a global issue. But there’s also something else: On the work place front, it’s been proven that local, regional or even nationally-based struggles cannot bring corporations to heel; what’s necessary as a first step is international working class action – global strikes, for example. (The ongoing Marriott hotel strike in the US is a perfect example.) But more than any other, the environment is an international issue. Not through such toothless, face-saving deals as the Paris Climate Accords, but through an international working class political movement. The impact is global and so must be the solution. It can start with imposing the elimination of fossil fuel dependency, but in the end what’s needed is a plan for economic development, one that is democratically controlled and managed by the working class itself. To even start to put this on the agenda, the building of a mass, working class party is necessary. After all, even the most liberal of the Democrats have proven they won’t raise the issues. To start down that road, a complete break with all the politicians of big business, Republican and Democratic alike, is necessary as a first step. Socialists should be shouting this from the roof-tops.